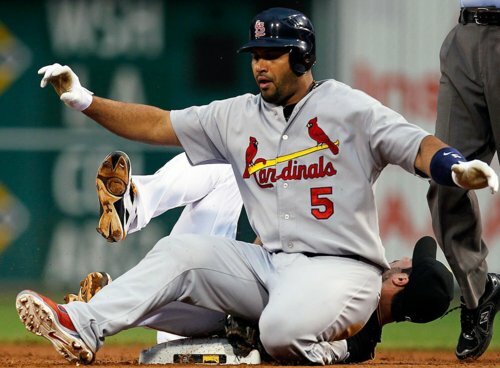 Somehow you knew St. Louis Cardinals first baseman Albert Pujols was looking forward to Friday night’s game against the Pittsburgh Pirates. According to the Elias Sports Bureau, here are the amazing facts: 1) he was facing the National League team against which he had his highest career batting average; 2) he was playing in the National League stadium at which he had his highest career batting average; and 3) he was facing as the opposing starter the pitcher against whom he had his highest career batting average (min: 15 at-bats). And Pujols the trifecta fell into place, as Pujols went 4-for-5, including a home run in the Cardinals 6-4 victory in Pittsburgh, making those incredible stats, even more amazing. Pujols actually raised his career batting average against the Pirates to .375 (with 46 home runs and 138 RBIs in 160 games); he lifted his career average at PNC Park to .393 (with 27 homers and 79 RBI in 81 games); and he boosted his career average against Paul Maholm (against whom he was 2-for-3, with a homer and a double on last night) to .583 (21 hits in 36 at-bats). Perhaps the rejuvenated Pirates might consider entering the Pujols sweepstakes. This entry was posted in LOL, Pittsburgh Pirates, St. Louis Cardinals, Statistics and tagged Albert Pujols, Baseball, Funny photo, Major League Baseball, MLB, Neil Walker, Paul Maholm, Pittsburgh Pirates, PNC Park, St. Louis Cardinals, Statistics. Bookmark the permalink.